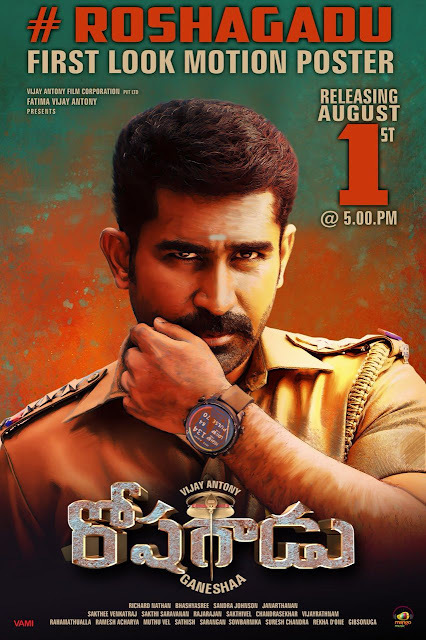 Vijay Antony is known for doing realistic characters in different genre films. The actor who is starring in family oriented and content based films is coming up with a full fledged entertainer. His upcoming film titled Thimiru Pudichchavan in Tamil is coming in Telugu as Roshagadu. The film's first look motion poster will be releasing at 5PM on August 1st. So far Vijay Antony won appreciations for doing content rich films. But for the first time he is coming up with a full fledged commercial entertainer. The title indeed is another big asset for a commercial entertainer. Nivetha Pethuraj of Mental Madhilo fame is leading lady in the film, wherein Deena will be seen in a crucial role. Vijay Antony is scoring music for the film produced by Fatima Vijay Antony under Vijay Antony Film Corporation Private Limited. Story and direction are by Ganeshaa, while dialogues and songs are by Bhashyasree.